Bel-Shalti-Nanna or Bel-Shalti-Nannar, named also Ennigaldi-Nanna, was a Babylonian princess who flourished around 554 B.C.E.. She was the daughter of Nabonidus (Nabu-na'id), the last Neo-Babylonian king and ruler of the city of Ur (modern Tell el-Muqayyar, Iraq), and sister of Belshazzar. She served as a high priestess in Ur. She was called the "priestess of Sin" (the god of the moon). Ennigaldi lived in the 6th century BCE. She had 3 careers. One was as a school administrator, running a school for priestesses that was already over eight centuries old when she took over. Another was as a museum curator. And still another was as a high priestess (the en-priestess). Archaeologist Sir Leonard Woolley notes in his work that her father king Nabonidus called her Belshalti-Nannar when she became the High Priestess of Nannar at Ur. Ennigaldi became high priestess in 547 BCE. Her grandmother (Addagoppe of Harran) was also a high priestess, but was at this time already deceased. 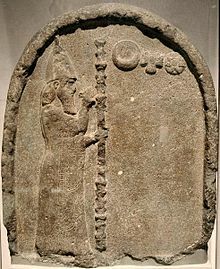 Ennigaldi received her additional name of Nanna because she was a high priestess of the male god Nanna (equivalent to the Old Babylonian moon deity Sin). She devoted much of her religious time in the evenings to Nanna in a small blue room on top of the Great Ziggurat of Ur. 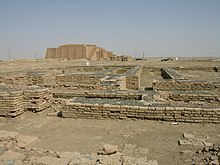 This worship temple at Ur for Ennigaldi, the high priestess, was called Nanna-Suen and was rebuilt by her father (it was originally rebuilt by Enanedu in the reign of her brother Rim-Sin I). This temple is also referred to as the "giparu" for the entu-priestess (high priestess) and was considered a sacred place for "private cultic use." While excavating in Ur, Sir Leonard Woolley discovered a room built for Bel-Shalti-Nannar around 550 B.C.E. The room is known as the Palace of the High Priestess Bel-Shalti-Nannar. The palace shares some design features with the South palace at Babylon, but on smaller scale. It is located on a trapezoidal plot by North Harbor of Ur. Along with her father, Nabonidus, Bel-Shalti-Nannar is known for being responsible for first controlled excavation and museum display. It is believed she help found a series of museums related to the discoveries made by Nabonidus. She is memorialized in The Dinner Party by Judy Chicago. Ennigaldi is noted by historians as being the creator of the world's first museum, a museum of antiquities. The priestess school Ennigaldi operated around 530 BCE was for upper-class young women. Ennigaldi spent much less time on corporal punishment because she had a devoted captive audience, even though otherwise her school resembled the other Sumerian scribal schools in its teaching techniques, curriculum, and student equipment. Literate women at her school were taught a special dialect called Emesal. ^ Casey, Wilson (2009). Firsts: Origins of Everyday Things That Changed the World. Penguin Books. ISBN 1-59257-924-8. ^ a b c d e f León, Vicki (1995). Uppity Women of Ancient Times. Conari Press. pp. 36–37. ISBN 1-57324-010-9. ^ a b "Bel-Shalti-Nanna". The New Encyclopædia Britannica. 2. 1997. p. 481. ISBN 0-85229-633-9. ^ E. a. Budge Budge; Sir Ernest a. Wallis Budge (30 November 2005). The Book of the Cave of Treasures. Cosimo, Inc. p. 278. ISBN 978-1-59605-335-9. Retrieved 18 October 2012. ^ Woolley, Leonard (November 4, 2014). Ur, la ciudad de los caldeos. Fondo de Cultura Económica. p. 134. ISBN 9786071624376. ^ Babylonian Historical Texts Relating to the Capture and Downfall of Babylon. Taylor & Francis. p. 56. GGKEY:KRCZY19CWEJ. Retrieved 18 October 2012. ^ Berrett, LaMar C. 1973. Discovering the world of the Bible. Provo, Utah: Young House. 217. ^ Potts, Daniel T. 2012. A companion to the archaeology of the ancient Near East. Malden, Mass: Wiley-Blackwell. 924. ^ Keller, Werner, and Joachim Rehork. 1981. The Bible as history. New York: Morrow. 295-6. ^ Buried History: A Quarterly Journal of Biblical Archaeology. Vol 5, No 1, March, 1969. page 13. ^ Frayne, Douglas. 1997. Ur III period, 2112-2004 BC. Toronto: University of Toronto Press. 159. ^ Smith, Sidney. 1924. Babylonian historical texts relating to the capture and downfall of Babylon. London: Methuen & Co., ltd. Page 56. ^ Ouzman, Sven. 2008. Imprints: an archaeology of identity in post-apartheid southern Africa. Thesis (Ph.D. in anthropology)--University of California, Berkeley, Fall 2008. page 36. ^ Harvey, p. 20 Princess Ennigaldi-Nanna collected antiques from the southern regions of Mesopotamia, which she stored in a temple at Ur - the first known museum in the world.